I lie in bed, counting to 30. We have many routines in our house, and this is mine. Veronica gets in the shower first. I go downstairs, fix coffee for us, fix breakfast for the kids, and bring her coffee before she’s done in the shower. If I’m efficient about it, I can catch an extra minute or two before getting out of bed — hence the counting. I reach four, but a scream from downstairs shatters the calm. It is Ryan. He is shouting in anger at Riley. This is an all-too-common scenario. She has said something to him and he has over- over- over-reacted. I feel my own anger surge. I slam the pillow with my hand and stalk out of bed, throw on my robe and storm down the stairs. Ryan is eating a plate of waffles and syrup on one couch. Riley sits on the opposite couch. Anger is obvious on both their faces. They have heard my stern footsteps; they know I am mad. They look at me in anticipation of what I will do. In that moment of our three-way stare-down, there is an opportunity. An opportunity for me to diffuse things. The situation calls for calm, but I am not calm. I am angry, something I find myself feeling a lot lately. I grab Ryan’s iPad from the table and put it on an upper shelf. He always plays with it after breakfast. He knows what this means. It is an escalation. I eye the lake of syrup on his plate and our almost-new, not-yet-destroyed couch and I tell him to eat at the kitchen table. This is a rule we have. Ryan knows the rule but has ignored it. I could let it pass but don’t, and one more spark hits the pile of dry brush. I need to address what happened that led to the screaming. I do so with confrontation instead of with calm because there is no calm within me. The reaction is as predictable as the tides. Ryan explodes, taking his voice to its highest volume. Instead of trying to settle him, I shout back, taking my volume right over top of his. I shout perhaps two or three words — I think it was JUST STOP IT — before catching myself. As the words come out of my mouth another part of my brain realizes how foolish this is, how I’m taking the exact wrong approach, and yet, I am powerless to prevent it. It has been only a few hours since our last such confrontation, which occurred during tooth brushing at bed time. I asked Ryan to repeat it because he hadn’t done a thorough job. I thought he was mocking me. Another brief outburst from both of us followed. We had a long, quiet talk before beginning bed time reading. I apologized, as did he. Here we are just a few hours later and the scene is already repeating. This is no way to start a day. We have yet another quiet discussion. Ryan and I talk about how what Riley said was perhaps a three on the annoyance scale and his reaction was a 12, which led to my reaction. We talked about following directions and following rules. I talked with Riley about not acting like his parent. We talked about all the similar incidents and what we can do to prevent them. Yes, I am stressed. Veronica is stressed. We are both having difficult days at work. The industry I work in is shut down by a labor dispute, creating uneasy times and uncertainty. I work in sports because it doesn’t often feel like a job. But not right now. We are trying to figure out what to do about Ryan’s medication. We are thankful for the feedback we get from his teachers and aide, but the messages are very mixed. We don’t know what to do. There is no obviously correct path. There are valid reasons for the tension in our house, but I don’t want to make excuses. I am the adult. I am the parent. I constantly preach to Ryan the need to control his emotions, and yet I have not controlled mine. More than anything, I hate the feeling that we are always on the verge of an explosion. Ryan has no mild emotions. Happiness, anger, sadness, enthusiasm: all are expressed in maximums. His dials go to 11. Riley has learned to tune it out, but I have a feeling she keeps much of it inside, choosing to nit-pick at Ryan as a form of revenge for the nasty things he sometimes says to her. Because of this, I need to react to chaos with serenity, but it is a skill I am far from mastering. I promise myself I will bottle that feeling of disappointment in myself and remember it before reacting next time. Will I follow through? I don’t know. 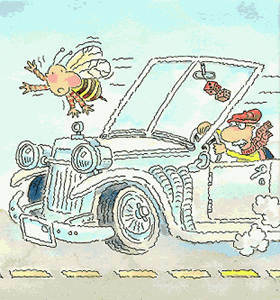 All I can do is step back up to the plate and try to do better — try to be the windshield instead of the bug. You know I get this. It is so hard sometimes to bring the calm…especially when tension is high due to outside sources (work, volunteering, etc). We need our “breaks” too, and I often find that my temper flares when my break is interrupted by incidents involving Tate’s behaviors. He, too, goes all the way up to 11. Deep breaths. Hang in there, and hope things settle down. Your family has a lot going on!! My heart goes out to you. Sometimes kids need to see how parents get upset and frustrated and show how certain behaviors can look. Just consider it a teachable moment. (But I will say that having heard your assertive footsteps I certainly would watch myself.) So maybe today you only give yourself a 99% on the “Perfect Parent” scale. You are way ahead of so many other parents you should give yourself a break. Well Neil the experts tell us that we only need to get it right 30%of the time (which seems utterly ridiculous to someone like me who likes to set the bar high). We are in the marathon of our lives and every now and then we need to blow off some steam. So forgive yourself and start fresh in the morning – clean slate. I’m just as guilty as you at getting angry and I really hate it. Wow! Just wow! Thanks for bringing this to my attention. So much of this is familiar. The over-over-over reactions to stuff. Rileys bottled up feelings that don’t mean they’re not there. My needing to be calm but instead just shouting over them. It’s so hard for ME to control and yet I ask them to control themselves. I like to think I’m getting a little better at this. Far from perfect, but striving to improve.